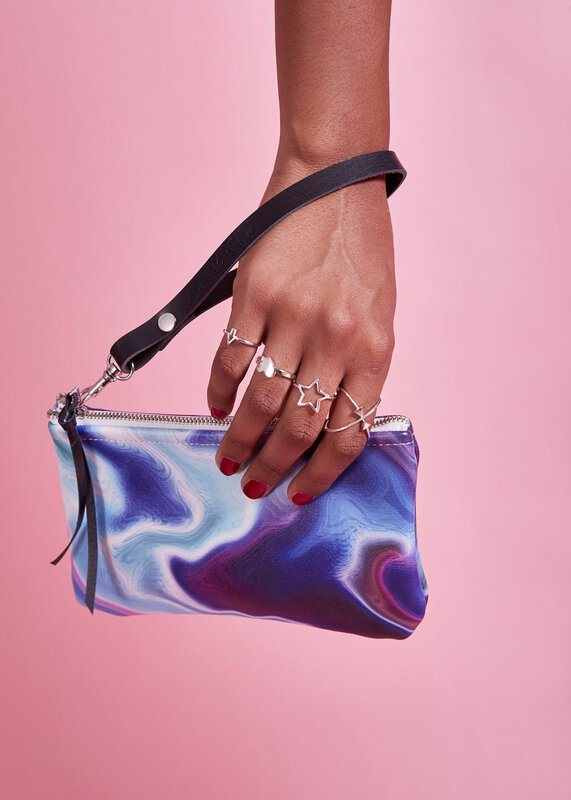 Where functionality, craftsmanship and original design meet, you will find Marisa Mu's vibrant and mesmerising bags and clutches. The thoughtful Sydney-based designer packs careful handiwork and unique technique into each item, using a studio-based process to create each 100% Italian cowhide piece. Having collaborated with a number of creatives and working in Melbourne Fashion Week, Marisa's journey is one to pay close attention to. I always knew I wanted to be an artist when I was a little girl but wasn't sure what creative direction I would eventually undertake. After finishing high school, I was adamant I wanted to be working within the textiles industry and after studying a degree within Design at COFA - my love for pattern design and working with the tactile quality of leather became a true obsession. That was a turning point for me when I made the connection between the love I have for colourful abstract patterning and the unique nature of leather skin. Playing with colours and textures and the changing nature of leather is what inspired me to undergo my current practice of creating unique colourful leather goods that are proudly Australian-made. I also knew from a young age that I was not going to be the type of person that could live a life of routine where I worked in an office doing the 9-5 for the next 40 or so years. Starting my creative practice enabled me to channel my energies into something that was giving me a sense of purpose and fed my creative soul and sanity. I see creativity and art as a therapeutic practice for me and I have overcome plenty of personal hardships because I turned to what I love most - creating art. I believe too many of us don't take that leap of committing to do something for ourselves - that is the core underlying reason behind why I decided to just bite the bullet and start my own line. My creative process is very organic and revolves predominantly around colour. The power of colour and the way in which hues and contrasting colours create an abstract wonderland is what I strive to achieve within my work. I chase the feeling of knowing I have created a wonderful colour combination and then allow the colours to bleed within one another and create their own special story. Working with leather is amazing as the skin itself had its own story - a past life that is now undergoing the process of becoming recreated and then forwarded to a new forever home. I use premium Italian cowhide and the beautiful textures make for a perfect contrasting canvas for the fluid aesthetic of the patterns. It is about creating sentimental pieces that hold layers of beauty and wonder. Is there a specific piece from your collection that is your own personal favourite? I go through phases and each design has held title of 'favourite' at some point. I am currently in the 'Smokey Camo' phase as the colours are a bit more muted from the usual bright and bold patterns. It's understated but still very much a statement piece. I will be releasing this pattern as a Bucket Bag style by the end of the week which is very exciting! Leather goods are seen as a long lasting investment. They stand the test of time due to the tactile and durable quality of being a skin - the colourful artworks are a reflection of how I perceive what is around me - colourful beauty. I want to implement my love for colour and pattern with simple silhouettes and bags that hold your daily essentials. I want to keep the bags simple and to not be excessive - it is about being a canvas for the artworks that we integrate within our daily lives. I strive to create long lasting works of art that we choose to carry with us. Something that brightens our days but also hold a key role of protecting and holding our valuables. It is a simple vision but a deeply soulful one. If your label was a song - which song would it be? It would be 'True Colours' by Kasey Chambers. I believe the spirit of my brand revolves around being someone that is individual, strong minded and colourful. I want my brand to be an embodiment of who I am and to empower others to be a statement maker within their everyday. To show your true colours, and to not be afraid to do so.